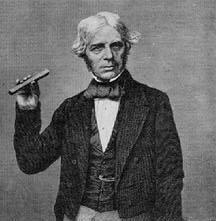 Michael Faraday was born on September twenty second, 1791 in England. He was well known as a physicist and a chemist. He had several endeavors in the fields of electromagnetism and magnetism during his life time. Michael Faraday was a citizen of England. His father was not so rich and he was just working as an apprentice to a village blacksmith. Due to his very humble background, Michael was not able to get much education. He however tried all he could to get himself educated. When he was fourteen years old, he became an apprentice to a book binder in their locality. He was attached to the bookbinder’s place for the next seven years of his life. Reason? There were plenty of books available there. He spent his time with the bookbinder reading books. He had exposure to several great writings of those days. One of the notable books that appealed to his young and ambitious mind was a book written by Isaac Watts, which title was “the improvement of the mind”. Another book that he found rather irresistible was a book titled “conversation on chemistry.” This book was written by Jane Marcet. Faraday later became an employee of Humphrey Davy, who was an English chemist. This employment came after Davy damaged his eyes while carrying out an experiment. In 1813, Michael later became an employee of the royal institute where he worked as chemical assistant. Later Michael had the opportunity to travel through Europe with Sir Humphrey Davy and this gave him an exposure to the science world of Europe. He was also able to make contacts with several elites in the European science world. The very first scientific work that Michael Faraday carried out was as an assistant of Sir Humphrey Davy. He delved into the study of chlorine later, during which he discovered two chlorides of carbon. He worked on the liquefaction of gases and he actually succeeded in liquefying quite a number of them. He was also the first person to invent something that looked like the present day Bunsen burner. He can also be said to be the one that discovered the chemical substance called benzene. Though he worked extensively in the field of chemistry, he also delved into physics. He performed several experiments based on electricity and magnetism. Today, he is one of the house hold names in those fields of physics. He used seven half-pence to construct what is known as the voltaic pile. Faraday was later out of electromagnetism for a number of years because of the strained relationship that existed between him and his benefactor; Sir Humphrey Davy. Faraday actually never gave up his inventive pursuit in the field of electromagnetism. He succeeded in inventing what is called mutual induction. He succeeded greatly in the area of field theory. He later used the principle of the mutual induction to construct what is called the electric dynamo, which is the principle that is used in constructing the present day’s power generator. Michael Faraday passed away in 1867.